Note: As much as I want to write about Adam "MCA" Yauch tonight, it's gonna take awhile for me to really put together my thoughts about one of my greatest inspirations. Look for a special Tunesday post dedicated to Yauch and the Beasties on Tuesday. going to re-create this scene soon. Fact: As the mercury rises, my running will drop considerably. I am just not built to run great distances in this heat. That being the case, I am going to ride as much as I can during what will probably be a sweltering summer. I've said that plenty of times in the past couple of years, and inevitably I've lost focus and neglected my bikes. Work, my relatively new love of running and my crashing fears got in the way. But not this time. More than anything, I need to conquer those damn fears once and for all. Shooting the criterium a couple of weeks ago and knowing friends who are going to have a blast this weekend riding Shiner G.A.S.P. (while I continue my OKC recovery) also are pushing me to pedal. 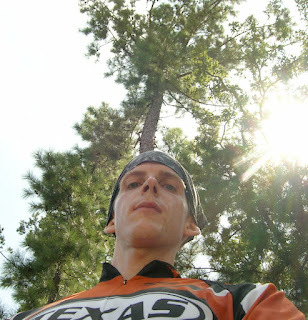 • May 26: Mesquite Rotary Bike Ride 100K — My Gar-squite roots compel me to ride this one. • June 9: Collin Classic 100K — I rode a shorter route at the Collin Classic a couple of years ago. I highly recommend this ride. • June 9-10: Tulsa Tough 68 and 63 miles — I just can't pass up this incredible race. Sorry, Collin Classic. The Tulsa Tough weekend — camping and cycling with some frunners — is a damn-fine reason to return to the Sooner State, um, er, ahem, sooner than I had planned. • June 23: Cow Creek Country Classic 100 miles — This is going to be a challenge. I've never done 100 miles in a day. The route passes through some cool small towns (Maypearl, Frost and Italy). No better way to see them than on a bike! • July: Since it's an especially hot and dry month, I will hit up the MTB trails. In particular, I'd like to do Cameron Park in Waco (one of my favorite trail systems —100 percent free to ride), Tyler State Park (roots, hills and pine needles — can't find this combo in many spots of the state) and Isle du Bois (never ridden it, but it sounds dynamite). • Aug. 25: Hotter 'N Hell 100 100 miles — This is the largest, single-day 100 mile ride in the United States. How could I not ride HHH?!? Whew, including training rides, I am going to log a lot of miles on the saddle this spring and summer. I've already cranked a slow, low-mileage ride this week. I'm meeting a good friend tomorrow morning for a faster 30 mile ride at White Rock. I'm stoked. So running will be on the back burner for awhile, but I'm not going to totally abandon it. In fact, I expect all this riding will make me want to run! Heck, I even have a good idea which marathon I'll run next May. I'll give you a hint: I hear the city rocks. Ah, they talked you into Tulsa. Y'all will have fun for sure!